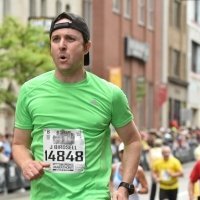 The Bee Foundation recently had the pleasure of speaking with Jason Birdsell, a member of our Philadelphia Marathon team. Jason has generously spent his time and efforts on raising money for brain aneurysm research, as well as providing us with some interesting insight into his training for the Philadelphia Marathon, his battle with injury, and his feelings as race day approaches! Jason is familiar with The Bee Foundation due to being a coworker at Vynamic with Jennifer Sedney, for whom The Bee Foundation was started after she passed away on Christmas day from a ruptured brain aneurysm. Jason worked together with Jenny on one of her last projects. Like Jenny herself, the Bee Foundation has a special place in his heart, so when he decided to sign up, he was eager to do it with The Bee Foundation to help the cause as much as he could. The Bee Foundation: Have you done a marathon before or is this your first one? Jason: This is my first one. With every day I have to remind myself not panic as it gets closer. TBF: How was your training? You said you had a hard time staying healthy during. J: The longest I have run so far is a half marathon, where staying healthy didn’t seem too big of a deal. It’s been challenging because when you’re running further your body reacts, stresses are different, and your body is like, “What are you doing to me? !” I found it to be that the runs themselves are not so challenging because of how long or far I am running, but simply trying to be healthy enough to do another long one later in the week. I’m not sure if it’s because I’m getting older but it’s a challenge. Thankfully I’m dealing with only one injury. I’m learning that part of the battle is just to get to the starting line in one piece. TBF: Are you hoping for a good race or just looking to finish the distance? J: When starting off I thought I wanted to hit a specific time, initially I would have loved to get something around 3.5 hours, but more into training I thought maybe 3:45. As I started running longer and began dealing with an injury, I’m now thinking, “How about 4 hours?” It’s been evolving and even though I’ve resigned myself to a slightly slower time, I’m learning how to tackle this distance for the first time. Just getting across line has become the main goal but under 4 hours would be great. I’ll be happy just to be standing and in reasonably good health when I finish. TBF: What is your general knowledge of brain aneurysms and your background with them, and have you raised funds for brain aneurysm research before? J: I have not raised funds for brain aneurysm research before. I have always been a supporter of The Bee Foundation and the Annual Honey Bash, but I haven’t run my own fundraiser for The Bee Foundation before like I am for the Philadelphia Marathon. My familiarity with brain aneurysms in general is that I’ve known at least two colleagues who passed away because of them. One was Jenny Sedney who was the cousin of The Bee Foundation’s founders. I had another work colleague a couple years prior pass away suddenly, as well. Also, a friend of my family suffered a brain aneurysm but thankfully survived. I’ve known too many people who have been impacted. I like The Bee Foundation’s mission because brain aneurysms are mysterious and frightening, and how can we be aware before they strike? I admire what The Bee Foundation is doing to raise awareness and fund research to make a difference. TBF: How did you get involved with The Bee Foundation/go about fundraising for the race? J: I reached out to Eileen Smith, a Bee Foundation board member, when I first knew I was doing the marathon, and asked how I could sign up with The Bee Foundation because I was aware of some runners who did it last year. Now as the day approaches I’m glad there is something else to motivate me, besides my own personal motivations to try to finish the marathon. I have used social media to put it out there to help raise money, and have been somewhat successful so far. Knowing I’ve gotten donations from people to complete the race is extra motivation. When you deal with injury there are doubts in your head, “Should I really do this?” I’ve always wanted to do a marathon so I’m excited to do it, but being a part of The Bee Foundation team and knowing folks have sponsored me is extra motivating. The Bee Foundation is a national nonprofit organization dedicated to raising awareness of brain aneurysms and funding innovative research that saves lives. The Bee Foundation was inspired by Jennifer Sedney, who died December 25, 2013 at the age of 27 from a ruptured brain aneurysm. We look forward to this incredible event that will change the lives of families that are affected by brain aneurysms. Please visit our website www.thebeefoundation.org to learn more about brain aneurysms and the ways you can become involved in this incredible foundation. Sign up to run the Philadelphia Marathon with The Bee Foundation today!